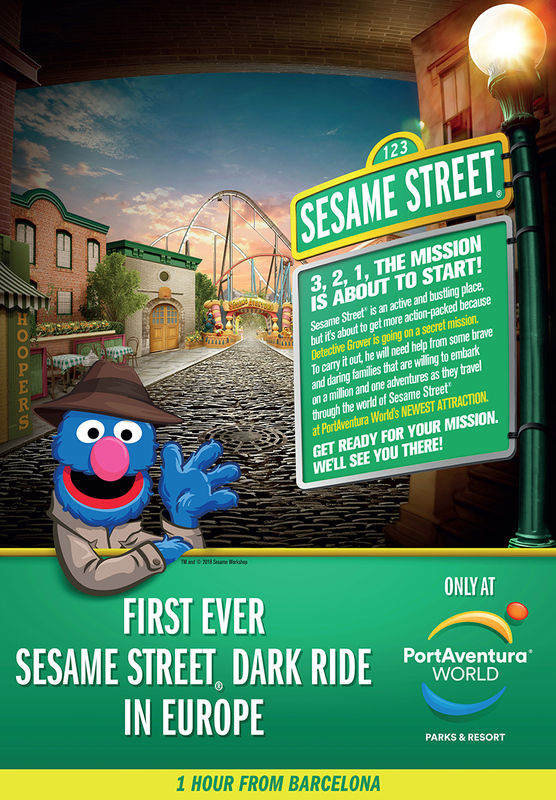 Sally Corporation, the dark ride specialists of Jacksonville, FL, PortAventura World, one of the largest European family destination resorts, and Sesame Workshop, the nonprofit educational organization behind Sesame Street, announced a new dark ride for 2019. The new attraction will be the first Sesame Street dark ride in Europe. The announcement was made at the International Attractions Expo with a life-sized animatronic Big Bird on display, telling guests about the new adventure he and his friends are about to embark on. Sesame Workshop The near six-minute long dark ride attraction will be housed in a newly constructed 14,000 square foot building and will feature a 10 minute preshow and 5:50 minute ride experience. Detective Grover will be your guide through this interactive adventure, urging guests to collect clues that will help solve a mystery happening on Sesame Street. With numerous animatronic characters, immersive scenery, and interactive gameplay, this mixed media attraction will appeal to guests of all ages. to fly through Count’s Castle and dive down into O scar’s Trash can. Recognized as the worldwide leader for turn-key dark rides, Sally Corporation specializes in building destination-quality attractions for regional parks around the world. Founded in 1977, Sally Corporation began as an animatronic production company to help market corporate brands in a unique and entertaining way. Since then, Sally has evolved into the lead designer and manufacturer of the most successful dark rides around the world. Sally’s services include custom design, special effects, animatronic and scenic fabrication, media integration, control systems and installation. www.sallycorp.com. PortAventura World Parks & Resort is the largest family leisure and holiday destination resort in Europe and throughout its 23-year history has welcomed over 80 million visitors. With a privileged location close to Barcelona, the resort operates four 4-star themed hotels and one 5-star themed hotel (PortAventura Hotels) with a total of 2100 rooms, and a convention centre (PortAventura Convention Centre) with capacity for up to 4,000 people. The range of leisure facilities on offer also includes 3 golf courses (two of which were designed by Greg Norman) and a Beach Club with direc t access to the beach. PortAventura World Parks & Resort is also home to a leading theme park and water park and the only Ferrari Land park in Europe, with a range of internationally-renowned attractions.